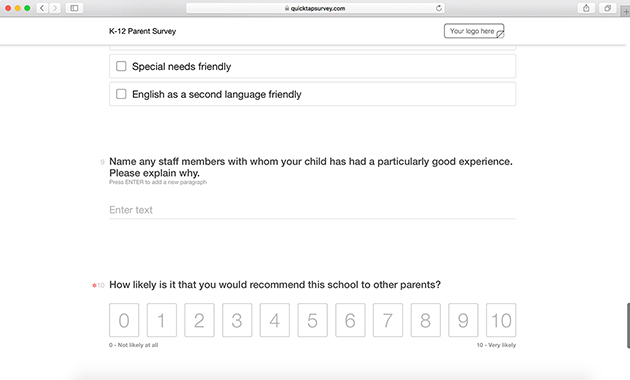 Collect feedback from parents to improve your school and better meet student needs. 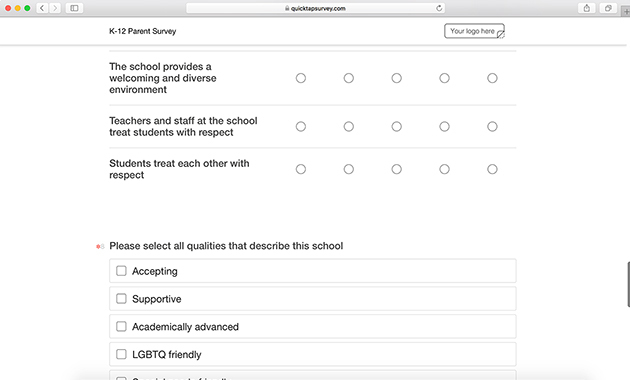 What is a K-12 Parent Feedback Form? 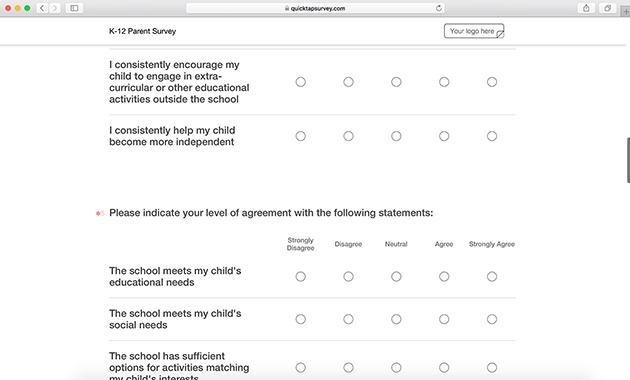 A parent feedback survey gives parents an easy way to communicate needs and share thoughts on their child's performance. This survey template touches on a variety of subject areas, including behavior, learning habits, safety, and inclusion. 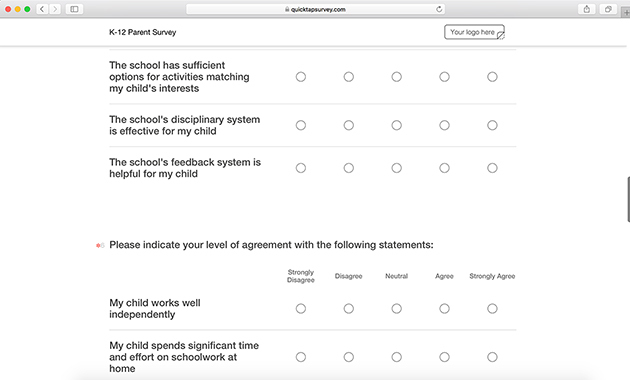 Why Should You Use a Parent Feedback Survey? A parent feedback form maximizes the success of both students and teachers by creating a medium for open, honest conversation. From a child's development to whether or not the parent would recommend your school, the insights you can collect are endless. While a student spends most of their time at school, parents are only there a fraction of the time. Gathering feedback ensures parents and teachers are on the same page. This survey can help you follow up with parents quickly if they bring up any concerns. Collect information from parents even if your school has spotty WiFi. Your data will sync with your account when you reconnect. Set up a kiosk in the front office to collect parent feedback. Instant notifications will keep you updated on any issues with uptime. Use NPS and CSAT scoring to create satisfaction reports that can be sent to teachers and administrators daily, weekly, or monthly. Send real-time notifications to different staff members upon submission so negative parent feedback can be addressed right away. 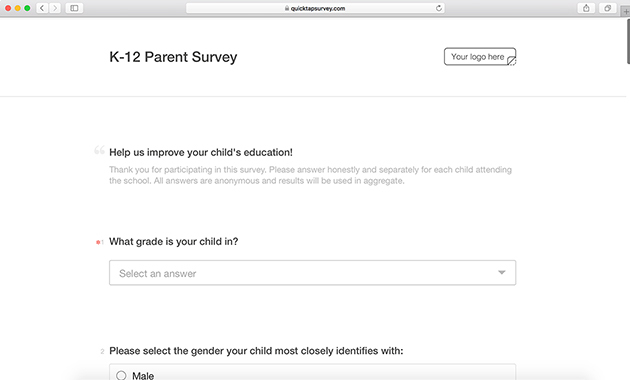 See the K-12 parent feedback form in action. 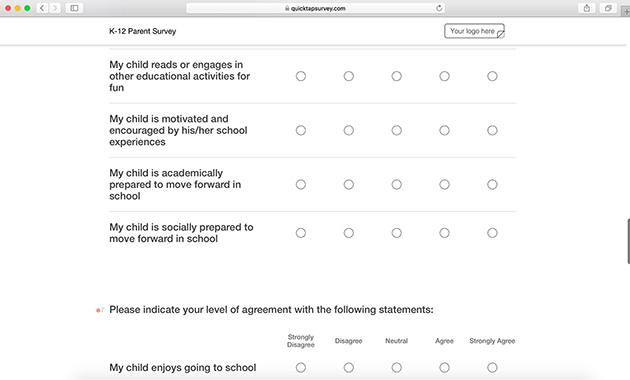 Start using this parent feedback survey right away by signing up for a free trial.